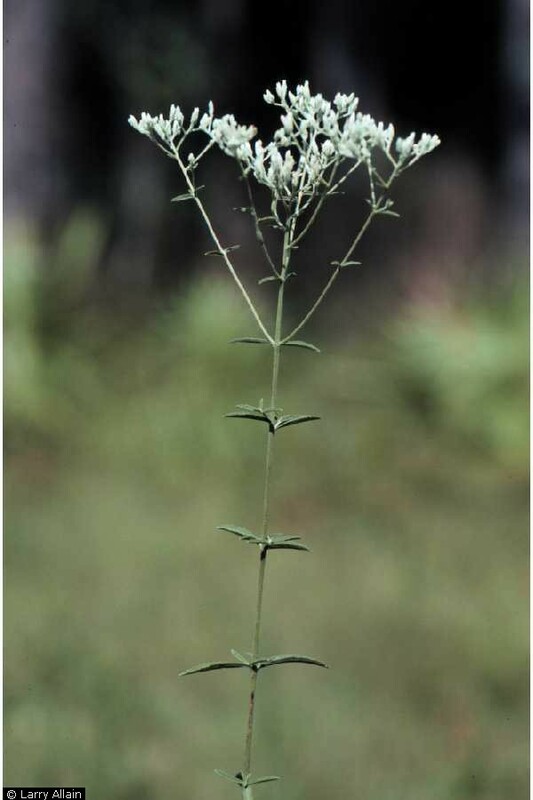 Eupatorium leucolepis.Copyright © Larry Allain @ USDA-NRCS PLANTS Database(Accessed 4/2014). Eupatorium leucolepis is a perennial herb 40-100 cm tall, stiffly erect, finely gray-hairy. Leaves opposite, stalkless, blade 3-8 cm long, 0.3-1 cm wide, linear to lance-shaped, thick, finely gray-hairy, sprinkled with tiny translucent dots (use lens), margin sometimes toothed. Flowers white, 5 per head, bracteate base 0.5-0.7 cm long, bracts hairy, overlapping, tips tapered to a point; inflorescence stems finely gray-hairy; blooms Aug-Oct.
Habitat: Wet sandy or peaty soil, coastal plain.